I'm Dan Benson. I'm 39. I live in NW Croydon and I work near Earls Court. 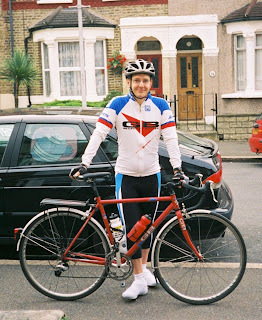 A Geoffrey Butler Audax, a steel beastie I’ve nicknamed ‘the FUCIM’ (Fabulous Urban Commuter and Ironman Machine). Every weekday, with the occasional café ride with friends on a Saturday. Always a helmet, it’s saved my bonce from more than a couple of dents over the years. That said, I can understand the reasons for choosing not to wear one. It used to be primarily for fitness, but I use running to maintain my weight now. Cycling is purely Point A to Point B – cheaply, quickly, efficiently. The nature of cyclommuting means that I can guarantee that tonight, without a puncture (touch wood), I will reach the childminder’s in no more than 45 minutes. Negotiating queues of cars, riding in the dark. The point where you and the bike are one, there’s no effort, and you become merely a pair of eyes floating above the road. Basic tools, a couple of spare tubes talc-ed up and ready to go, and eyes in the back of my head. How many locks do you carry, and have you ever had a bicycle stolen? I have a D lock, and I’ve never had a bike stolen (again, touching wood). I tend to lock up in obvious places, detach and lock the front wheel to the frame and back wheel, and take its quick-release skewer with me. I once had a light stolen, so I take those and my speedometer off too. Always look around you. Get used to looking behind – the ‘lifesaver look’ – especially when pulling out or overtaking. If you’re a driver, drive your bike defensively; if you don’t drive, brush up on the Highway Code. Never overtake a lorry or a bus on the inside. Ride in the moment – forget any time goals and focus on what you are doing now (I find if I focus only on the few yards about me, without thinking about the rubbish junction ahead or the inattentive driver behind, etc., I often arrive quicker than anticipated). And remember to breathe occasionally!! 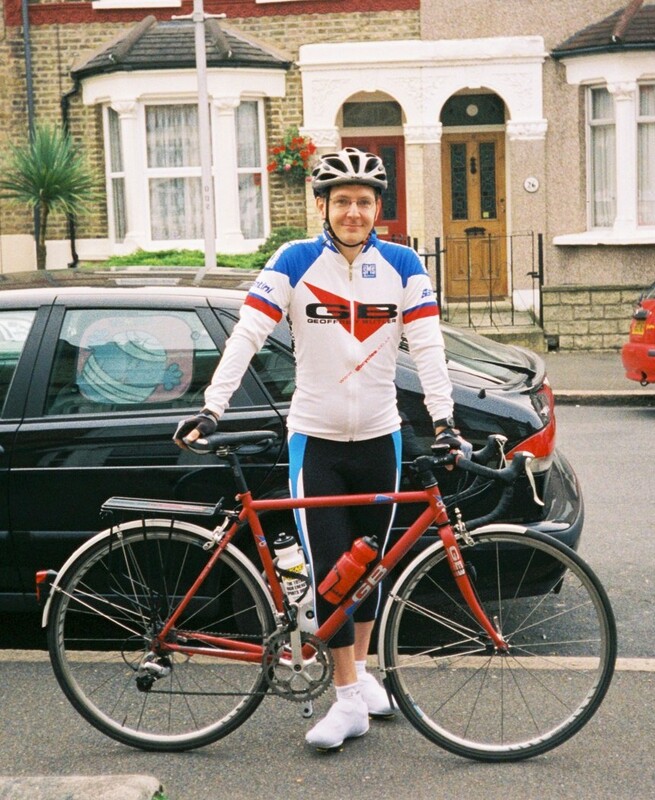 If you were Mayor of London for the day, what would you do to improve the lot of the London cyclist? Infrastucture. I’d build new, Dutch-sized lanes and I’d take away lanes from automobiles and give them to cyclists, for two reasons: 1. More cyclists, less congestion and 2. Traffic flow studies I’ve seen recently that bear out the idea that restricting car routes has the effect of improving traffic flow, when you’d think the opposite. I used to be an advocate of ‘vehicular’ cycling but now I’ve been swayed to the idea of segregating facilities. If done properly and not as a token gesture (like today’s narrow and badly-maintained ‘paths’) it could have a revolutionary effect on London’s roads. And in 15 years, no one will remember it being any different. Given another day as Mayor, we could talk about restricting lorries to outside the North and South Circular – or even beyond – and a blanket 20mph speed limit. As a driver and pedestrian as well (get me, a triple threat!) I think all these things would do nothing but benefit our lives, making them safer, cleaner and maybe even a bit more time- and cost-efficient. Dan's a genius. Elect him Mayor today!